Days of rain is causing streams and creeks to overflow. 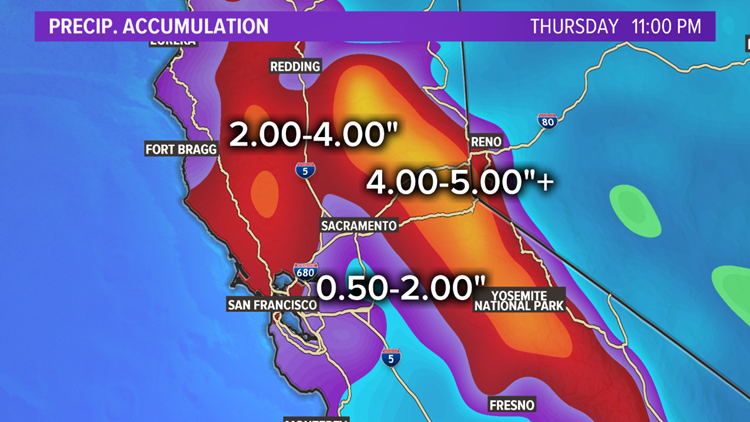 Some areas connected to the northern Sacramento River and the Cosumnes River could see flooding in the coming days. SACRAMENTO, Calif. — UPDATE 2:00 p.m.
A FLOOD WARNING is in effect for the Cache Creek at Yolo from this afternoon to Friday afternoon. At 9:30 a.m. Thursday the stage was 78.3 feet. Moderate flooding is forecast. A FLOOD WARNING in effect for the Cache Creek at Rumsey Bridge until late tonight. Forecast to fall below flood state of 14.0 ft late this morning then forecast to recede near 9.0 ft early tomorrow morning. A FLOOD WARNING continues for The Sacramento River at Ord Ferry from this afternoon or until this warning is canceled. Minor flooding is forecast. Expected to rise above flood stage of 114.0 ft this evening then forecast to crest near 116.0 ft late tomorrow morning. A FLOOD WARNING continues for the Sacramento River at Tehama Bridge. Forecast to rise to near 217.5 ft this evening then forecast to fall below flood stage of 213.0 ft tomorrow morning then forecast to recede to near 212.5 ft late tomorrow morning. Rain showers remain in the forecast through Sunday morning. A FLOOD WARNING is in effect for the Cosumnes River at Michigan Bar Thursday morning through Friday morning. 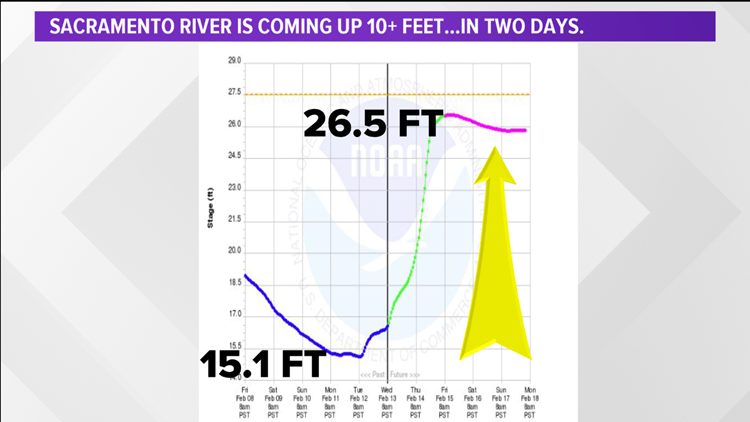 The river is expected to rise above flood stage by noon Thursday then start falling during the afternoon. This will cause water to flow onto surrounding roads in the Wilton area. A FLOOD WARNING is in effect for the Sacramento River at Vina Woodson Bridge until at least Sunday afternoon. Flood stage is expected around noon Thursday. Recreation areas around Woodson Bridge Park will be closed until the water recedes. Tap here to see the live radar. A FLOOD WARNING remains in effect until 7:30 p.m. Thursday for urban and small streams in the Sacramento Valley and surrounding foothills. This is due to prolonged periods of rain and snowmelt. Burn scars also have a risk of mud and debris flows. Rain will be heavy at times Thursday along with gusty winds during the day. A Wind Advisory is in place through Thursday with gusts 40-50 miles per hour. Tap here to see the 10-day forecast. A FLOOD WARNING is in effect for urban areas and small streams for rain and snowmelt until 8 p.m. As rain continues across the area, many locations have picked up around 3 inches of rainfall. That in addition to snowmelt occurring in the foothills will add to the potential for flooding. Some locations that will experience flooding include Redding, Red Bluff, Yolla Bolly District Rs, Alder Springs, Shasta Dam, Palo Cedro, Shasta Lake, Anderson, Dairyville, Sugarloaf, Central Valley, Whiskeytown, Henleyville, Ono, Paskenta, Chrome, Millville and Mountain Gate. There is also a FLOOD WARNING in effect for Northwestern Colusa County, North Central Lake County, Western Tehama County, Western Glenn County, and Southwestern Shasta County until 3:30 a.m.
A WINTER STORM WARNING remains in effect for the northeast foothills and Sacramento Valley until Friday 4 p.m. Heavy snow will make travel difficult to impossible. Chain controls are expected. Be prepared for significant reductions in visibility at times with strong gusty southwesterly winds to 50 mph or higher at times across the higher elevations. SNOW LEVEL: 2 to 5 feet of snowfall above 5,000 feet in elevation expected. 6 to 12 inches of snowfall for the foothills near Redding. A WINTER STORM WARNING remains in effect until 10 p.m. Thursday above 7,000 feet for the Greater Lake Tahoe Are and Mono County. Heavy snow above 7,000 feet. Total snow accumulations of 5 to 10 inches expected between 7,000-8,000 feet, except 2 to 5 feet expected above 8,000 feet, including Mammoth Lakes. Winds could gust as high as 55 mph with ridge gusts possibly exceeding 150 mph. SNOW LEVEL: Snow levels are rising and should reach 8,000-8,500 feet by Wednesday afternoon and evening. Snow levels will then fall back below 6,000 feet Thursday afternoon and evening. A large and long lasting Atmospheric River will nail California this week with wet weather resulting in some of that rain melting recent snow and adding even more water to local creeks and streams and flow into reservoirs and rivers. 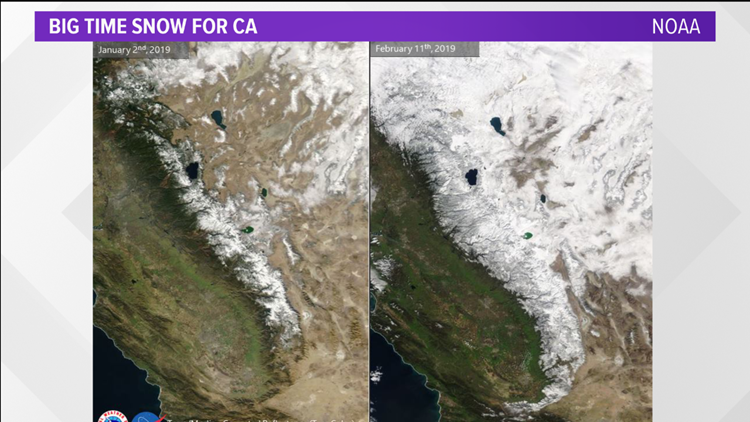 Recent snow in the lower foothills has added to an already large snowpack in California that is well above average. Foothill communities should expect to see some of that snow melt with the incoming warmer storm before seeing snow Thursday and Friday. 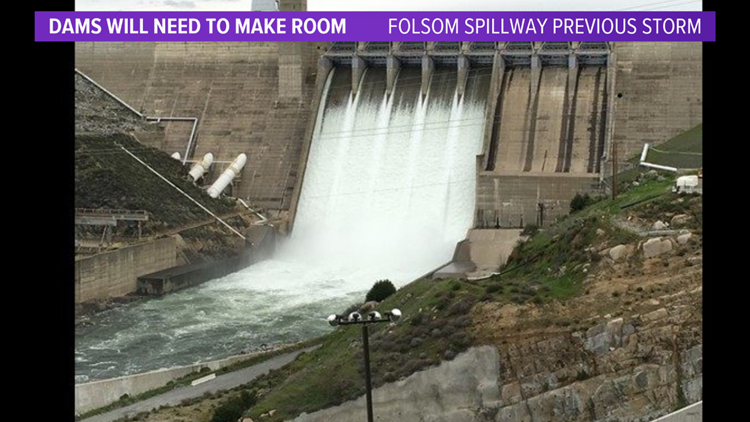 To make room for the incoming water, managers at state and federal reservoirs will open up spillway gates to create room for incoming water. This will add water to rivers below those dams with the increase in water flow and height could be dramatic to spectators. Forecasters for river levels predict a more than 10-foot rise in the water level, from 15 to 25 feet, for the Sacramento River at the I-Street location near the Tower Bridge. This is below the monitor stage, and well below flood stage for that section of the river, but it will still be high. It will also be close to similar crest levels from 2016 and 2017. The net result will be high water for all rivers, but a steep and dramatic rise to well-known rivers like the San Joaquin and Sacramento that drain into the California Delta and the Pacific Ocean. You can expect dangerous boating conditions, delays at bridges to allow boats to pass, and debris in the muddy water. If you're viewing on the ABC10 App, tap here for multimedia. Continue the conversation with Rob on Facebook. A downpour of rain during the Wednesday morning commute led to dozens of crashes on Sacramento area freeways. Wrecks blocked traffic on I-5, Highway 50, I-80 and Highway 99 creating gridlock for drivers. This is a raw look at some crashes and backups during the morning commute in Sacramento and Elk Grove, California.